"This is not to say that nanotechnology is a far-off, fuzzy, futuristic technology. It is not. It has already established a beachhead in the economy. The clothing industry is starting to feel the effects of nanotech. Eddie Bauer, for example, is currently using embedded nanoparticles to create stain-repellent khakis. This seemingly simple innovation will impact not only khaki-wearers, but dry cleaners, who will find their business declining; detergent makers, who will find less of their product moving off the shelf; and stain-removal makers, who will experience a sharp decrease in customers. This modest, fairly low-tech application of nanotechnology is just the small tip of a vast iceberg--an iceberg that threatens to sink even the "unsinkable" companies." View the list created by the Project on Emerging Nanotechnologies, called A Nanotechnology Consumer Products Inventory. It contains over 803 current (as of December 2008) products. Researchers at Pacific Northwest National Laboratory have developed a coating process to make sponge-like silica latch onto toxic metals in water. Self-Assembled Monolayers on Mesoporous Supports easily captures such metals as lead and mercury, which are then recovered for reuse or contained in-place forever. © PNNL One example of a SAMMS nanocomposite (Self-Assembled Monolayers on Mesoporous Supports). An hexagonally close-packed cluster of tubular pores (end view) is shown in the foreground. A single pore, in this case coated with a mercaptopropylsiloxy monolayer, is shown in the background. 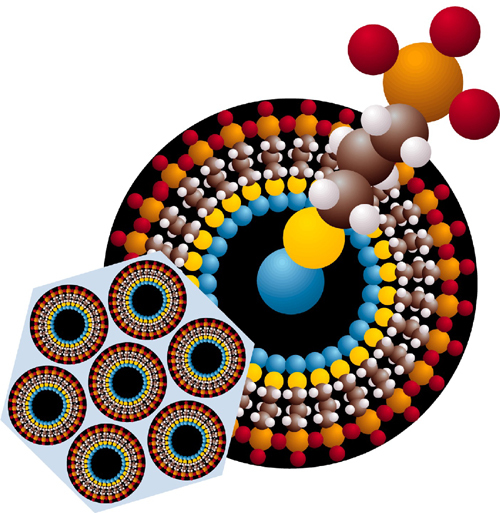 A model of one surfactant molcule is also shown. See Will copper sop up radioactive pollution? for details. A plastic nanocomposite is being used for "step assists" in the GM Safari and Astro Vans. It is scratch-resistant, light-weight, and rust-proof, and generates improvements in strength and reductions in weight, which lead to fuel savings and increased longevity. And in 2001, Toyota started using nanocomposites in a bumper that makes it 60% lighter and twice as resistant to denting and scratching. Impact: Will likely be used on other GM and Toyota models soon, and in other areas of their vehicles, as well as the other auto manufactures, lowering weight, increasing milage, and creating longer-lasting autos. Likely to impact repair shops (fewer repairs needed) and auto insurance companies (fewer claims). Will also likely soon be seen everywhere weight, weather-proofing, durability, and strength are important factors. Expect NASA, the ESA, and other space-faring organizations to take a serious look, soon, which will eventually result in lower lift costs, which will result in more material being lifted into space. Electron micrograph of typical silicon nanocomposite cross section showing uniform distribution of conductive carbon nanotube network. Photo courtesy of U.S. Air Force. See Electrically Conductive Polymer Nanocomposite Materials for details. Strong and light sounds like the perfect recipe for a golf club, of course, which is why so many golf club manufacturers are now devoting big bucks to nano R&D. Thus far, the only company among the big boys to convert research into tangible products is Wilson, which offers three drivers, a fairway wood, four balls and even a golf bag made using nano-materials. "Metal nanocrystals might be incorporated into car bumpers, making the parts stronger, or into aluminum, making it more wear resistant. Metal nanocrystals might be used to produce bearings that last longer than their conventional counterparts, new types of sensors and components for computers and electronic hardware. 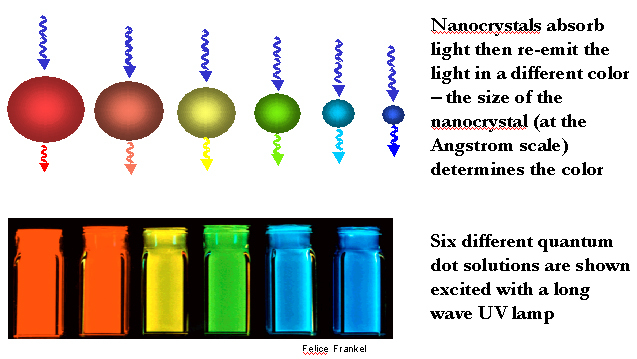 Nanocrystals absorb then re-emit the light in a different color -- the size of the nanocrystal (in the Angstrom scale) determines the color. 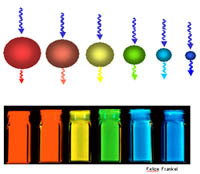 Six different quantum dot solutions are shown, excited with a long-wave UV lamp. Quantum dots are molecular-scale optical beacons. Qdot� nanocrystals behave like molecular LEDs (light emitting diodes) by "lighting up" biological binding events with a broad palette of applied colors. Smith & Nephew markets an antimicrobial dressing covered with nanocrystalline silver (A patented Technology of NUCRYST Pharmaceuticals). The nanocrystalline coating of silver rapidly kills a broad spectrum of bacteria in as little as 30 minutes. Stain-repellent Eddie Bauer Nano-CareTM khakis, with surface fibers of 10 to 100 nanometers, uses a process that coats each fiber of fabric with "nano-whiskers." Developed by Nano-Tex, a Burlington Industries subsidiary. Dockers also makes khakis, a dress shirt and even a tie treated with what they call "Stain Defender", another example of the same nanoscale cloth treatment. Sunscreens are utilizing nanoparticles that are extremely effective at absorbing light, especially in the ultra-violet (UV) range. Due to the particle size, they spread more easily, cover better, and save money since you use less. And they are transparent, unlike traditional screens which are white. These sunscreens are so successful that by 2001 they had captured 60% of the Australian sunscreen market. AngstroMedica has produced a nanoparticulate-based synthetic bone. "Human bone is made of a calcium and phosphate composite called Hydroxyapatite. By manipulation calcium and phosphate at the molecular level, we have created a patented material that is identical in structure and composition to natural bone. This novel synthetic bone can be used in areas where natural bone is damaged or removed, such as in the in the treatment of fractures and soft tissue injuries." See this Kemco International page for a list of applications for nanoparticles. Kodak is producing OLED color screens (made of nanostructured polymer films) for use in car stereos and cell phones. OLEDs (organic light emitting diodes) may enable thinner, lighter, more flexible, less power consuming displays, and other consumer products such as cameras, PDAs, laptops, televisions, and other as yet undreamt of applications. Used in packaging, like beer bottles, as a barrier, allowing for thinner material, with a subsequently lighter weight, and greater shelf-life. Wilson Double Core tennis balls have a nanocomposite coating that keeps it bouncing twice as long as an old-style ball. Made by InMat LLC, this nanocomposite is a mix of butyl rubber, intermingled with nanoclay particles, giving the ball substantially longer shelf life. Nanoledge makes carbon nanotubes for commercial uses, of which one mundane (marketing tactic) use is in a tennis racket, made by Babolat. The yoke of the racket bends less during ball impact, improving the player's performance. Applied Nanotech recently demonstrated a 14" monochrome display based on electron emission from carbon nanotubes. And Samsung is expected to demonstrate a CNT-based 32" display by the end of 2003. China's largest coal company (Shenhua Group) has licensed technology from Hydrocarbon Technologies that will enable it to liquify coal and turn it into gas. The process uses a gel-based nanoscale catalyst, which improves the efficiency and reduces the cost. Argonide Nanomaterials, an Orlando based manufacturer of nanoparticles and nanofiltration products, makes a filter that is capable of filtering the smallest of particles. The performance is due to it�s nano size alumina fiber, which attracts and retains sub-micron and nanosize particles. This disposable filter retains 99.9999+% of viruses at water flow rates several hundred times greater than virus-rated ultra porous membranes. It is useful for sterilization of biological, pharmaceutical and medical serums, protein separation, collector/concentrator for biological warfare detectors, and several other applications. Impact: In the future, for one application, sterilizing drinking water, this product may have an impact on so-called Third World peoples, who only have access to dubious sources of water. These are just a few of the many ways in which nanotechnology is working itself into our everyday lives. At present, there are no nanobots, no molecular-scale machines, and no assemblers - these are still in the basic research stages, and may not be seen for decades (although many would argue that a concerted effort would bring them to fruition in just a few years).